By the time you're done with the opening tutorial, you should be at level 6 with two workers and enough shiny (the premium currency in the game) to buy a third. The very first thing you should do is buy the third worker, which costs 500 shiny in the store. The more workers you have, the faster you can build, and a third worker is well worth the expense. You can get more shiny by picking mushrooms (or with real money of course). A fourth worker costs 1000 shiny and you probably won't find that much in mushrooms alone before your camp is built to maximum. When you start the game, you have a 7-day grace period when no other players can attack you. Your top priority should be your resource buildings: harvesters and silos. The faster and earlier you build them up, the more you'll have in the long run and the better off you'll be. The harvesters are: twig snappers, pebble shiners, putty squishers, and goo factories – in that order of importance. Twigs and pebbles are used to build everything else, with slightly more twigs than pebbles needed. Work on upgrading those first. 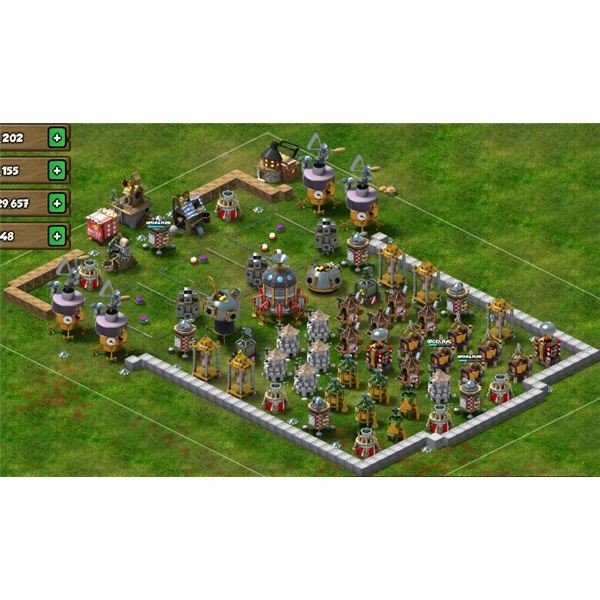 Putty is used to build and upgrade offense and defense buildings Putty unlocks and upgrades your monsters. You can also catapult putty to boost your monsters while attacking other backyards. When you're not able to upgrade twig snappers or pebble shiners, work on upgrading putty squishers. Early on, you ideally want enough putty on hand at any time to always keep either the monster locker or academy busy. Which brings us to silos. While twigs and pebbles flow in and out of your stores at a steady rate, you'll need to accumulate putty to massive amounts and then spend it all at once. This means it all has to fit in your silos. To build and upgrade these as fast as possible, you'll also need to upgrade your town hall. The only use for goo is to make monsters. Early on while you're still in the grace period, you won't need a whole lot – though you can use it to raid Wild Monster backyards (the Kozu, Abunakki, Legionnaires, and Dreadnaughts). You can slack on upgrading your goo factories. One last Backyard Monsters strategy tip about resources: don't upgrade all buildings of the same resource at the same time – especially twigs and pebbles. The buildings don't accumulate anything during upgrades and you'll end up with shortages. Also, bank everything out of them before you start. While other players can't attack your Backyard Monsters backyard during the grace period, Wild Monsters can. Fortunately, they're easy to fend off if you just buy as many towers as your town hall allows and spread them around a bit. Start focusing on tower upgrades about two days before grace runs out. If you worked on resources first, you'll have plenty to do this in time. After the grace period, each backyard has two main targets: the town hall, and the resource buildings (harvesters, silo, town hall). Taking down a town hall means that the game declares you victorious, which can be good for the ego. However, any smart player knows that resources are the truly important part. The only other building where you can lose something if it's destroyed is the monster housing. Any monsters in it will die. All other buildings just repair themselves and all you lose is time if they were upgrading or unlocking something. Any monsters in a hatchery will still be there after the hatchery is destroyed and repaired. Therefore, when designing your backyard's defensive layout, your top priority is to protect your silos and harvesters. Town hall is second highest priority (it also holds resources), and housing is third. Aside from fending off enemy monsters charging in from the ground, also keep catapults in mind. These can hit anywhere – but the attacker gets nothing if they destroy a resource building by catapult. One useful strategy is to surround your towers with harvesters so that if they catapult the tower they'll also damage the harvesters. One last strategy tip about defense: keep your resources spent. Your silo sacks get bigger depending on how much is in them. Big full silo sacks attract more resource thieves than little sacks. To attack other backyards, click the map button at the lower right. You can also get to the map through the flinger, catapult, or map room. Early on when your map room is level one, the map shows you your immediate neighborhood. The default view is an aerial map, which shows you the location of each player and wild monster tribe. Far more useful is the List view – click to see whether players are online, how many times they've attacked you, whether they're in damage protection, and a bunch of other information. You can view a target backyard for as long as you need. 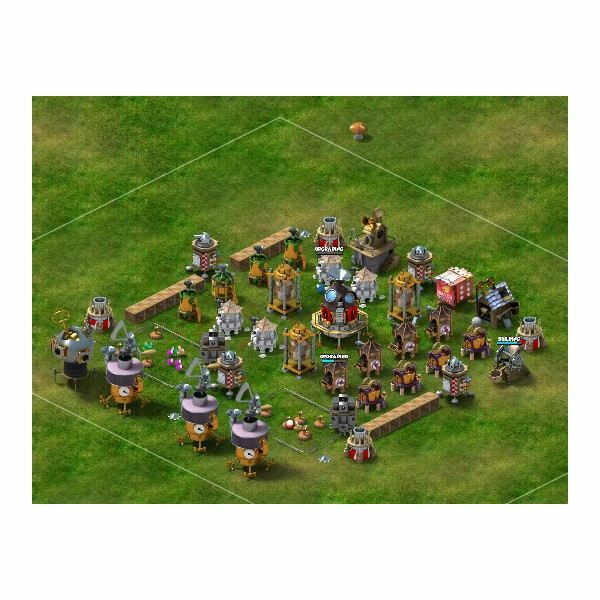 Look for weaknesses in their defenses – for example, places not well-covered by towers, unguarded resource buildings, a bunch of towers all in a clump that can be taken down by a single large catapult, etc. Be careful of breaks in any walls, as those might have booby traps. Plan where to fling your monsters. Remember that you can fling several groups in waves, or in multiple spots – they don't all have to be in one big fling. Decide how many and which types of monsters to use. Also plan for a second round of monsters in case the first round fails. Then go back to your own backyard and make them in your hatcheries. When your first round is ready, queue in the second round. Put the ones with the longest timers at the front of the line – for example, if you have three hatcheries and want three DAVEs, put one DAVE per hatchery. Wait until each hatchery finishes its first second-round monster and goes into pause due to lack of housing space. While you're attacking with the first-round monsters, the rest of the second-round monsters will crank through the hatcheries and be ready to go by the time you get back. One last tip about how to attack in Backyard Monsters: make sure you have enough goo on hand to make every monster you need before you start. The more advanced monsters are expensive – don't get caught short of goo while trying to take someone down. Whether you’re starting the game or starting to build outposts, this guide is for you. Learn how to build, how to defend, how to attack, and how to expand.